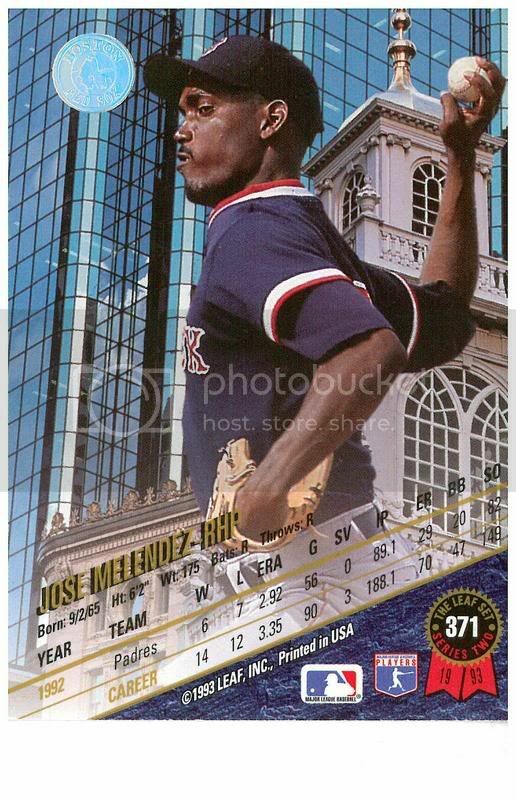 It’s time for Jose Melednez’s KEYS TO THE HOT STOVE. 1. It’s over. It’s finally over. More than thirteen years since the end of his brutal reign and more than 22 years since its beginning, the last vestiges of James G. "Lou" Gorman have been at long last expunged from the Boston Red Sox. The temptation would be to slink into nostalgia. To sadly lament the departure of Christopher “Mosey” Nixon, the original Dirt Dog, and one time next Mickey Mantle. One could recall his 3-0 drive off the wall off of Jason Marquis in Game 4 of the 2004 Series, his home run off of Roger Clemens in the Rocket’s famous duel with Pedro or simply his reckless disregard for his own personal safety. But Jose will leave that to the eulogists, who plod their days away, writing doleful obituaries for the not yet dead. Rather than looking wistfully back at Nixon, Jose will view his departure as a cause for celebration, not so much for the end of his career, but for the end of the era he represented. Nixon was a Cuba of a player, an enigmatic and poorly understood relic of a past age. While Cuba was left, after the fall of the Soviet Empire, as a strange anachronism, the last gasp of the Comintern, Nixon played the same role in the Gorman Empire, a final bulwark of a dead age. Nixon, like Cuba, was a screen onto which observers projected their hopes or fears. Leftists see in Cuba a workers paradise of free healthcare, high literacy and unlimited ice cream, rightists a cruel dictatorship and kleptocracy. Similarly, some look at Nixon and see a “real baseball player,” a man who plays hard, gets his uniform dirty and keeps his mouth shut. Others see an oft injured, overrated outfielder who never learned to hit left handed pitching and never lived up to his promise, a player who was loved for the color of his skin far more than for the content of his game. And that is the end of the Gorman era and it is time to move forward. Unless the Red Sox bring back Gorman acquisition Roger Clemens, in which case they might as well put Lou back in the GM seat and dig up Mrs. Yawkey. As he departs for Cleveland after spending his entire career in Boston, right fielder Mosey Nixon consented to give the Boston press corps one final interview. 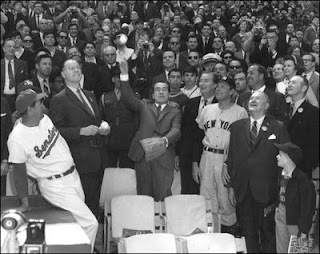 When asked how it felt to be leaving Boston, Nixon responded “"As I leave you I want you to know--just think how much you're going to be losing--you won't have Nixon to kick around anymore, because, gentlemen, this is my last press conference." Cleveland's new outfielder show's his stuff. 3. Two days ago Rob Bradford wrote in the Eagle-Tribune, the Merrimack Valley’s Pulitzer Prize winning newspaper, that Mr. Matsu is unlikely to bring a windfall to the Red Sox. Bradford argues that because of league revenue sharing rules, very little of the funds from increased sales of Red Sox merchandise and the like in Japan will benefit the Red Sox. But this is a shortsighted approach to the problem. So what if the League takes hat sale money. So what if the Red Sox can’t partner with Asahi beer because they are betrothed to Bud? The Red Sox just need to think outside of the box. All Jose knows is that his favorite Indian restaurant in Boston, Kenmore Square’s India Quality Restaurant, had a review up in Japanese when he went there last week. Suffice it to say, this was new. The Sox don’t need to make the money in Japan to make this work. The Japanese will come here, and the Red Sox just need to take advantage of it. So here is Jose’s idea. If even local Indian restaurants (note: delicious as there food may be) are preparing for the Japanese Invasion, the Red Sox should start an ultra high end Japanese restaurant at the park. You know, the sort of placing selling Kobe steaks, the price of which could finance the next three years of Dustin Pedroia. Better yet, they could start a Karaoke Bar. The Japanese love karaoke! I’m Jose Melendez and those are my KEYS TO THE HOT STOVE. 1. When Jose woke up this fine, clear morning, perhaps the coldest old Boston has seen this year, he was treated to the agony and… well… agony of a cold shower. There are times when a cold shower is appropriate, even enjoyable: outside after a long swim on a hot summer day, any time when one is a teenager. Eight in the morning when it is nine degrees out, however, is not one of them. No, in these circumstances, said type of shower is a classic example of taking a bad thing (note: being cold) and making it worse (note: becoming cold AND wet). Which brings us to Roger Clemens. Jose’s relationship with Roger Clemens, the relationship of all of Red Sox nation with Roger Clemens is a lot waking up to nine degree weather. It is unpleasant, it is agitating, and it makes one think back on the past, not fondly about the good times when the sun was warm and the air was fragrant with dogwood blossoms, but about how those happy days, that comfort, were snatched away. Think about it this way. If your boiler died, would you sit around happily recalling the good old days when you had heat, or would you be angry that it had left you cold and alone? At the same time, we humans are an adaptable species. We change, we adjust. If the warmth were truly gone forever, fur would again seem fashionable, we would huddle under wool blankets or perhaps build igloos. The new status quo would become manageable but not downright comfortable. But now imagine that your old boiler was going to get fixed. So you throw away your furs, they’re cruel you know, give your blankets to the homeless and hop in for a nice, hot shower. And then… ice water. Your lungs spasm; your heart twitches; you cry out. You feel fooled, deceived. Does it feel like closure? Like coming full circle? No, it feels like ice, like pain, like death. And this is what we are in for if we sign Roger Clemens. We will turn the faucet of memory, expecting the heat to flow like honey. But instead it will flow like Martian rivers, which is to say not at all, the cold water of Clemens’ dotage will hit us square in the face chilling our bones and sending our private parts into humiliating retreat. If this is this winter of our discontent, the January of our agitated griping, let us put up the weather stripping, stock up on blankets and burn IKEA catalogues and back issues of Pro Wrestling Illustrated for warmth. The boiler has belched its last hot water; it is dead and gone. Or maybe it just needs to have the air drained out of it, and then it will work fine again. Either way, Jose really hates Roger Clemens. 2. In today’s New York Times, Manhattan area pinhead Murray Chass (note: not to be confused with the Matthew Perry character “Chazz” from early Fox sitcoms “Second Chance” and “Boys Will Be Boys”) suggested that if the Red Sox and DJ Dru are unable to meet terms, the Sox could look to Barry Bonds as an alternative. Under the Chass Doctrine, Bonds would play left and Manny would return to right field, where he played with the Indians. While at first blush, this proposal appears to be “insane,” “unconscionable,” “grounds for impeachment” and “stunningly incompetent” maybe Chass is on to something. Despite being a lighting rod and appalling defensive liability, Bonds can still swing the bat, and Jose thinks there is a scenario wherein the Red Sox could play bonds and Manny in the corners without giving up too much in terms of ground covered. The key is for Rococo Crisp to be really, really fast. He’s already fast, but like way faster, like the Flash or Quicksilver or Carl Lewis with diarrhea. Of course, that may not be possible, but that’s where Bonds can contribute defensively. You know he could score Crisp some speed. Jose’s entire performance in Spanish. Refers to itself in the third person. And that concludes today’s adaptation of Gypsy, with music by Jule Styne, book by Arthur Larrents and dictionary research by KEYS reader Jack Roy. STOLE 1,406 BASES TO BECOME MAJORS’ ALL-TIME STEALS KING. 1990 A.L MVP. ALL TIME RUNS SCORED LEADER. ONCE WAVED TO THE MELENDEZETTE AFTER JOSE MELENDEZ SHOUTED OUT TO HIM. ILLEIST. I’m Jose Melendez, and those are my KEYS TO THE HOT STOVE.